Back to the daily grind again! I hope everyone had a lovely weekend. The weather here was delightfully fall-ish, with sunny skies and cooler temperatures. We spent the day over in Little Osaka and walked around that neighborhood and spent time at the park. I was stoked to have a caramel milk tea with pudding - it tasted exactly like flan in drink form. Delish! Next time I want to go back and try the okonomiyaki restaurant, they've got all sorts of toppings from pork belly to corn. Oy, now I'm hungry again. Rumbling tummy aside, I started today's mani with Revlon Jelly, a bright coral red crelly that went on smoothly with no streaks or pooling. 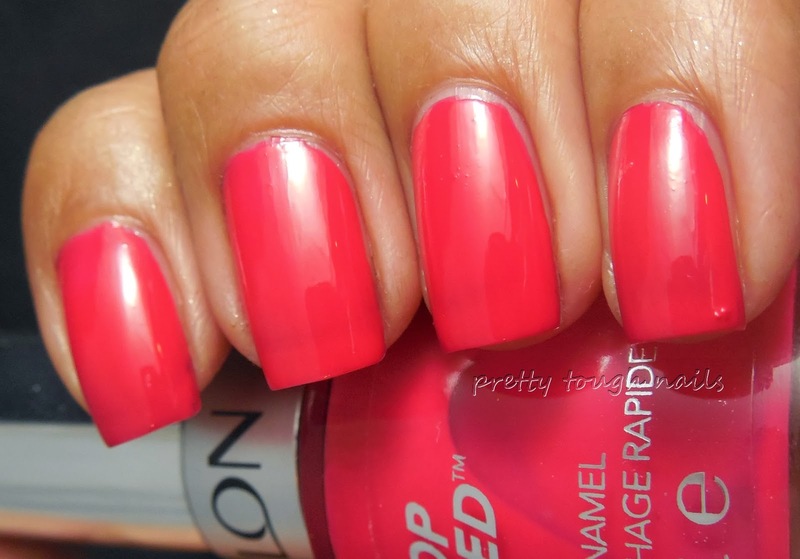 I haven't used a Revlon in ages and I was really impressed how easy it was to apply. I used two coats here with no topcoat. It has a squishy quality to it but it's not a true jelly, despite its name. And now, the pièce de résistance, I used a layer of CrowsToes Tequila Sunrise that was given to me by a wonderful fellow blogger, Liz from Lacquer Slacker Liz. I fell in love with Tequila Sunrise after seeing her swatches here, and she was generous enough to share that beauty with me. 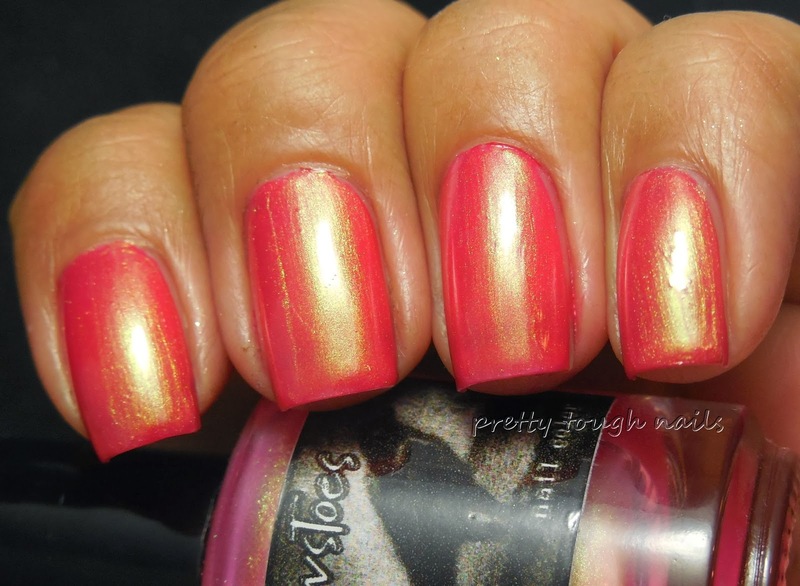 Tequila Sunrise is magnificent pink sheer jelly with contrasting green shimmer. I had a little difficulty with the formula, but I'm blaming myself because I was super tired at the time. I used one coat over Jelly, and with my no not so steady hands I ended up with a little pooling and some brushstrokes. This is finished with a layer of topcoat. Holy Shimmer Batman! I love the golden green shimmer popping against that pink base. This is such a unique combination of colors, and I don't believe I've seen anything similar to this. Crowstoes is a creative genius(or mad scientist!) and continues to produce beautiful polishes like this. Now that I've gotten a taste, I need to have MOAR! Dangerous fruit, totally awesome! I'm so glad you have this and yes, we must have MOAR! Do you know of a OPI, Essie or China Glaze polish that is similar to the Revlon Jelly color? 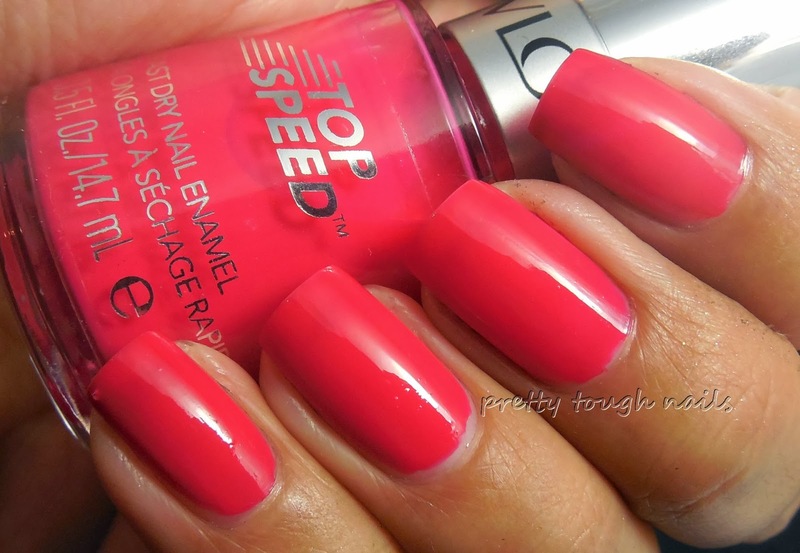 I love that color but the quick dry polishes don't last long enough on me. Hmm... offhand I'm thinking of Essie Sunday Funday, and China Glaze Shell-o from their summer collection, although it might be too orange. Hopefully one of those will work for you!